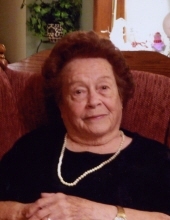 Mrs. Mary Benson Lee, 98, of Dunn died Tuesday evening April 2, 2019 at her home surrounded by her family. Mrs. Lee was born April 18, 1920 in Johnston County daughter of the late James Oscar and Sally Ann Grimes Benson and was also preceded in death by her husbands, Eugene Lee, Hugh V. Lee; daughter; Brenda Lee Williford; son-in-law, John Williford; daughter-in-law, Sally Lee; brothers, Judson and Leon Benson; sister, Callie Benson; great granddaughter, Katie Lynn Lee. Mrs. Lee was a graduate of Westbrook High School and had worked for Devil Dog Manufacturing Company in Newton Grove. She was a member of Shady Grove OFWB Church. A funeral service will be held 2 p.m. Saturday, April 6, 2019 at Shady Grove OFWB Church with Rev. Chris Hall and Rev. Ricky Lee officiating. Burial will follow at Memorial Cemetery in Dunn. Mrs. Lee is survived by her son, Landis Lee of Clinton; daughters, Donna Edwards and husband Pete and Tammy Lee both of Dunn; nine grandchildren, Scott Lee (Donna), Ricky Lee (Jackie), Kathy Henderson (Dennis), Wanda Philligan (John), Mike Hollingsworth (Nancy), Tommy Lee (Christina), Jason Barefoot (Denise), Mark Edwards, Matt Edwards; twenty- two great grandchildren and nine great great grandchildren. The Lord recently blessed her with another great-great grandchild, Jayce Barefoot Jackson. He was truly a bright spot in her life that she bonded to. The family will receive friends 12:30 - 2 p.m. Saturday at the church and at other times at the home. Memorials may be made to Shady Grove OFWB Church 7605 Newton Grove Hwy. Dunn, N.C. 28334. To send flowers or a remembrance gift to the family of Mary Benson Lee, please visit our Tribute Store. "Email Address" would like to share the life celebration of Mary Benson Lee. Click on the "link" to go to share a favorite memory or leave a condolence message for the family.